One of the striking differences between the Millennium Development Goals set in 2000, and the post-2015 Sustainable Development Goals, is the latter’s emphasis on domestic resource mobilisation – set against the aid-centricity of the former. While this is welcome (primarily because of the enhanced potential for domestic “ownership” of priorities, and the ensuing political benefits), it does raise a question. A new paper published in leading health journal, The Lancet, tackles this question. 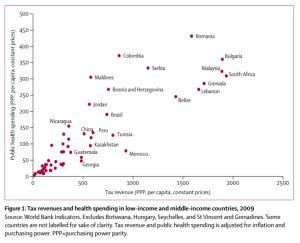 Reeves, Gourtsoyannis, Basu, McCoy, McKee and Stuckler construct a panel of revenue, expenditure and health data for 89 low- and middle-income countries, from 1995-2011, and use it to explore the relevance of different sources of financing. They reach two main findings. 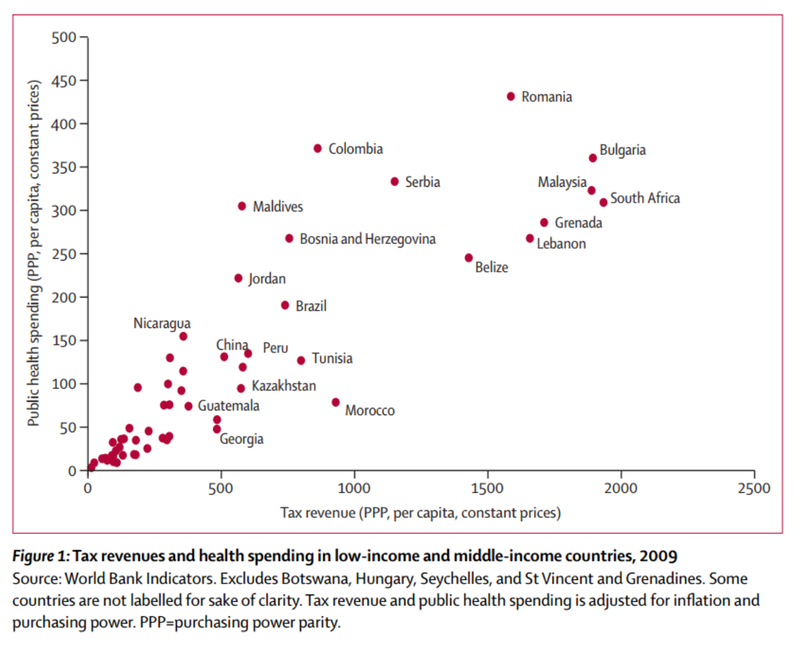 First, as you’d expect, they uncover a fairly strong association between tax revenues and health spending (Figure 1 – click to enlarge): more tax revenue per capita… more public health spending per capita. In a simple model, an additional $100 of GDP per capita is associated with $1.86 of extra health spending; while an additional $100 of tax revenue per capita is associated with $9.86 of health spending. There is also (Figure 2) support for impact on health outcomes. Second, the authors find that the association hinges on direct tax in particular. They find that $100 of direct tax revenue per capita is associated with $16 of public health spending; whereas consumption and other taxes appear to have a small negative association. 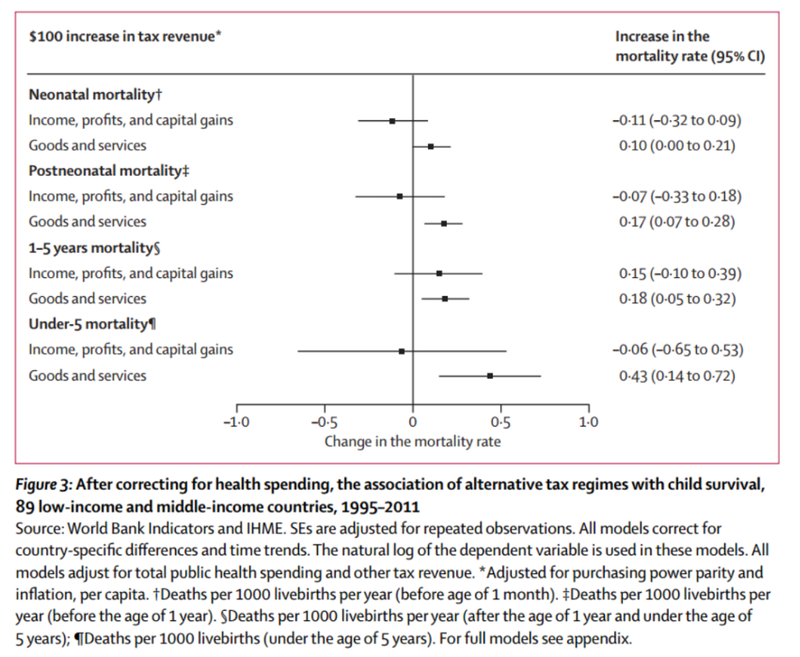 Most strikingly (Figure 3) there is an association between consumption taxes (but not direct taxes) and mortality outcomes. What should we make of these results? (Does VAT kill children?) The authors are cautious about the limitations of World Bank tax data, and about direct causal interpretations of the results. But perhaps still more caution is needed. Broadly speaking, we expect direct taxes (on income, profits and capital gains) to be more progressive than taxes on consumption – since households with lower incomes inevitably consume more of their income. In addition, there is some evidence to suggest that direct taxes are the most powerful in driving governance improvements associated with greater reliance on tax revenues rather than say natural resources or aid – on which, see Mick Moore’s really useful, critical survey in this ebook. So if direct taxes are a progressive tool associated with better governance, should we expect also to see better public spending outcomes? Perhaps, and maybe even probably; but let’s be careful. Correlation and causation again. If governments are more or less interested in progressive taxation, and more or less interested in universal service provision, we’d expect those to line up so that governments favouring progressive tax will generally also deliver more broad-based improvements in (e.g.) health. But that’s not the same as saying that if all governments increased direct taxes (by diktat, or from changes in international norms, or – say – improvements in the transparency of multinationals), that they would also all focus more on health improvements. We know that there are strong correlations between GDP per capita and tax/GDP. We know, too, that this holds most strongly for direct taxes. In addition, the sample period covers what is probably the peak of the “tax consensus” which inter alia encouraged consumption taxes above all others, and the relative neglect of direct taxes. In general, such advice was most powerfully passed into policy in those countries with least capacity and least political space to resist. This paper is a thought-provoking contribution, but due both to data weaknesses and to the difficulties of establishing causality, it can’t be more than suggestive. The challenge for further research is to address, as far as possible, these two issues. We can’t show that specific tax policies necessarily deliver different spending policies or outcomes (these are separate policy choices); but we may be able to demonstrate the associations more strongly, not least by allowing more effectively for the causal roles of per capita GDP and state capacity, and/or by focusing on specific moments of policy change to understand the effects. This entry was posted in tax and tagged FfD, health, post-2015, tax, TJRB by Alex Cobham. Bookmark the permalink.